If you run a small business, you know how important customer relationship management, or CRM, can be to your bottom line. And you know it can be a bit daunting. Well, not with GoldMine and GoldMine 8 For Dummies! 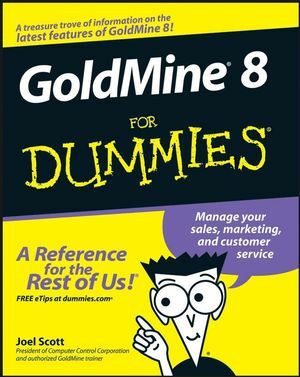 Even if you’ve used a previous version of GoldMine, you’ll find some big changes in this newest revision, but GoldMine 8 For Dummies makes it easy to get up to speed. When you’ve read this book and discovered how GoldMine can help you keep track of your clients, reduce costs, and improve efficiency, you’ll think you’ve hit the motherlode! Joel Scott is the president of the Computer Control Corporation, a technology consulting company founded in 1985. Mr. Scott began selling GoldMine software in 1991. The company has been awarded FrontRange’s “GoldMine Top-10 Dealer” award eight times since then and has received numerous other awards for GoldMine training and best practices. In 2007, Computer Control Corporation joined with Core Solutions, Inc., headquartered in Newton, Massachusetts. The newly combined company continues to sell and support GoldMine as well as several other well-known CRM products, such as Microsoft CRM and SalesLogix. This is Mr. Scott’s fourth GoldMine For Dummies book, and these sit on his bookshelf right next to the two Microsoft CRM For Dummies books that he has co-authored. Always happy to hear from readers, Mr. Scott can be reached at dummy@ccc24k.com. To assure a response, please include all your contact information. Part I: GoldMine Premium Basics. Chapter 2:Getting Around in GoldMine. Chapter 3: Setting Up Your Preferences. Chapter 4: Accessing GoldMine Remotely. Chapter 5: Creating and Viewing Client Records. Chapter 6: Handling Notes and Secondary Contacts. Chapter 7: Details and Referrals. Chapter 8: Using Filters, Groups, and SQL Queries. Chapter 10: Viewing Scheduled Activities. Chapter 11: Dealing with and Completing Scheduled Activities. Part IV: Marketing and Support. Chapter 13: Managing Your Leads. Chapter 14: Managing Your Marketing. Chapter 16: Integrating with Word. Chapter 17: Sending and Receiving E-Mail. Part VI: Organizing and Distributing Information. Chapter 20: The Knowledge Base. Chapter 21: Graphical and Statistical Analysis. Chapter 22: The Reporting System. Chapter 23: Opportunity and Project Manager. Chapter 25: Creating New Labels and Fields. Chapter 26: Creating and Modifying Lookup Lists. Chapter 28: GM+View and GM+Browser. Chapter 29: Integrating GoldMine with Your Web Site. Part VIII: The Part of Tens. Chapter 30: Ten Useful Add-Ons. Chapter 31: The Ten Most Important New Developments Since 6.0.